TimeSphere Wall Clock - White dial. 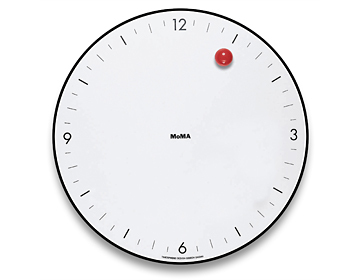 Designed for The Museum of Modern Art, NY, the TimeSphere Clock captures the essence of pure, minimalist design. A seemingly gravity-defying ball travels around the dial to mark the time, creating an eye-catching illusion. Made in the USA of injection-molded ABS recyclable polymer, the clock features a high-torque, precision quartz movement. One AA battery is required.